When is the last time you encountered a piece of content that made you want to share it with friends? When is the last time a blog post or webinar made you want to spend your money? Your audience’s behaviour will reveal how much your content resonates with them. So how can you ensure your content is high-quality? The practices of content scoring and auditing can help you develop content that not only resonates with audiences but drives them to convert. These marketing practices provide you with the information you need to develop material that gives value to your target audience. Instead of having to guess at what your customers are looking for, both practices allow you to use past data and behaviour to offer high-quality content. So, before we get into the details of using these two methods, it makes sense to define the purpose of content scoring and content auditing. At its core, content scoring is the process of setting and measuring the predictive performance of content, before publishing. If you are in charge of creating content, the chances are high that you are already monitoring analytics regarding your content’s performance. However, as revealed by definition, content scoring goes a bit further. The ultimate purpose is to assign values to content based on how effective it is regarding the generation of leads and conversions. For example, the material that a customer first comes into contact with will likely have a higher score and influence than another piece of communication they encounter in the middle of their buyer journey. This material could be a blog post, webinar, or social media posting that causes a customer to become more involved in your brand. 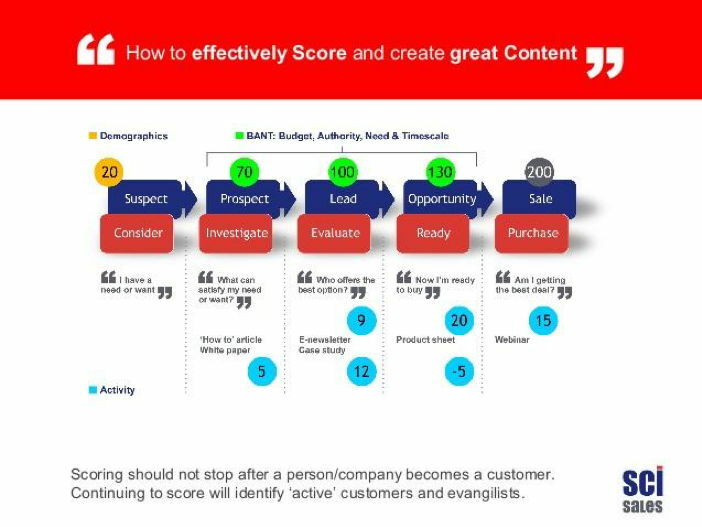 Content scoring allows you to see the unique characteristics of each piece of content and how it can impact the behaviour of audiences. It helps you to rely less heavily on paid advertisements. Instead of just putting a large amount of money toward paid ads, you can save money by utilizing the intentionality of content scoring. It forces you to analyze the performance of your content before publishing. As a result, you can develop clear goals that you can compare to actual performance data. Content scoring provides a deeper understanding of your audience. For example, if a specific segment of your audience is interacting with a particular piece of content, you can begin to understand why this is occurring and apply these insights to other material. You have a better understanding of the ROI of your marketing efforts. 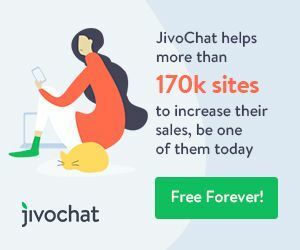 You can now better convey the importance of content marketing to leadership, and show how investing in specific types of content benefits the company as a whole. Content scoring takes all of the “hunches” and “guesswork” out of content marketing and creation and makes it more likely that you will produce high-quality material. While content scoring is crucial, content auditing is another essential element to creating content that converts. Content auditing is a crucial component of content scoring. In its purest form, content auditing requires you to gather data regarding previous content to understand and analyze the patterns. While content scoring typically focuses on the quantitative measurements of your content, auditing is more so involved with qualitative analysis. You would assess all of your content, understand the strengths and weaknesses, and measure its performance against the KPIs (and potentially the scoring) you set ahead of time. Again, it’s an additional method for drilling down to understand the results of your content. You can begin to understand the material that is performing well, and why this is the case. It will enable you to compare popular content with less successful content so you can create a strategy for improvement. You can begin to get a sense for how effective your SEO keyword strategy is, and if you need to do better keyword and trend research. Content auditing also gives you an idea of the content that needs to be updated or removed. 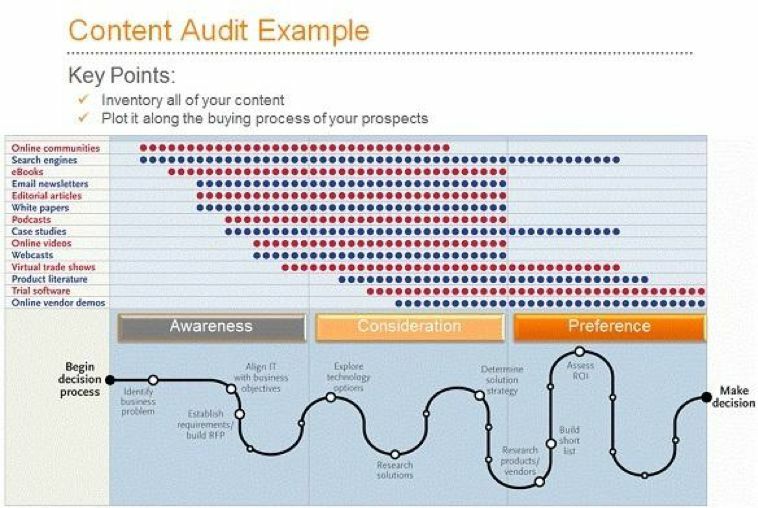 So, now that we have a sense for what content scoring and auditing is, we need to understand how to do a content audit and how it can benefit your content marketing plan. Keep reading for a content score and content audit checklist that will give you a step-by-step plan for utilizing content auditing and content scoring. The content audit process includes the four steps below. 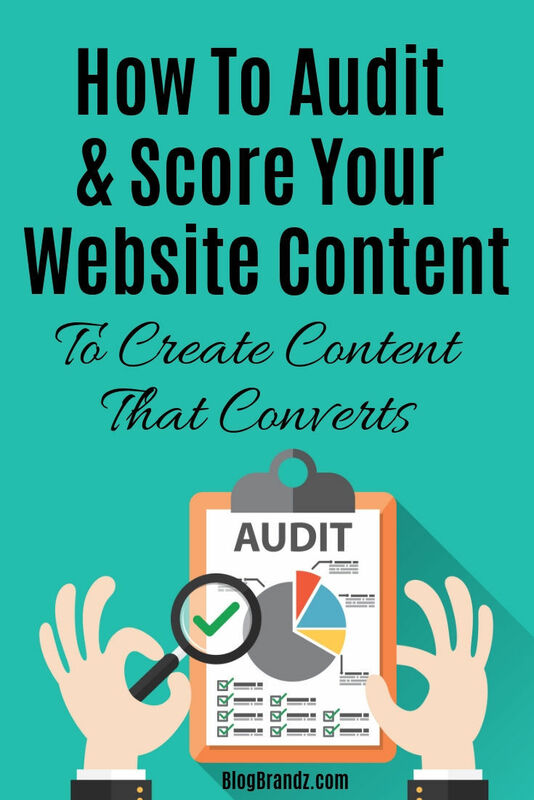 You can use a content audit tool or content audit software to help you. Take time to understand your intentions for conducting a content audit. For example, you may want to beef up your SEO rankings, assess the effectiveness of your content marketing efforts, or see if your content is leading your audiences where you want them to go. Knowing what you want to accomplish ahead of time will better streamline the process and allow you to focus on the data and information that matters. Seeing if there any gaps in the content you are providing (especially in comparison to competitors). Separate high performing pages and topics from low ones. Use high performing themes to create topics for future postings. Do an SEO content audit to improve your SEO ranking (with specific results). Understand if you are producing too much of one type of content. Assess whether your material is aligning with business goals. Examining whether you are maintaining the voice of your brand throughout your content. One of the best ways to start this process is to open up an Excel spreadsheet or Google Doc and list out variables that you want to monitor. There are a variety of variables to enter and track. Essentially you are creating a content inventory document to “dump” all of the information regarding your content in this content audit worksheet. Depending on the intentions for your audit, you can then begin to analyze the effectiveness of your previous content. For example, you may want to assign grades based on page views or social shares. However, you might also want to alter keywords or update content that is no longer ranking. Go back to your intentions and then decide on whether you will keep content, update it, or remove it; while also determining the content structures and topics you want to replicate for a future article. There are various paid and free content audit tools that you can use to find the recipe for how to make content perform better. Much of the information you gathered during your content auditing process can be useful for the scoring process. Looking at your content auditing results can provide you with background knowledge that will help you assign appropriate values to content and understand the behaviour of your audience as a whole. Now, take a more in-depth look into the journey of your customers. Tools like Google Analytics can help you see the content that is attracting the most consumers and how they navigate through your website. Also, look at your segments to see how each is finding their way to a conversion. Using past content data, add scores to your content based on the influence they have on your audience. Those that do not have as much impact on your consumers will have a lower score. Now that you have an idea of which the type of content that is performing the best, you can then create measurements for each one and score each component based on predictive analysis. 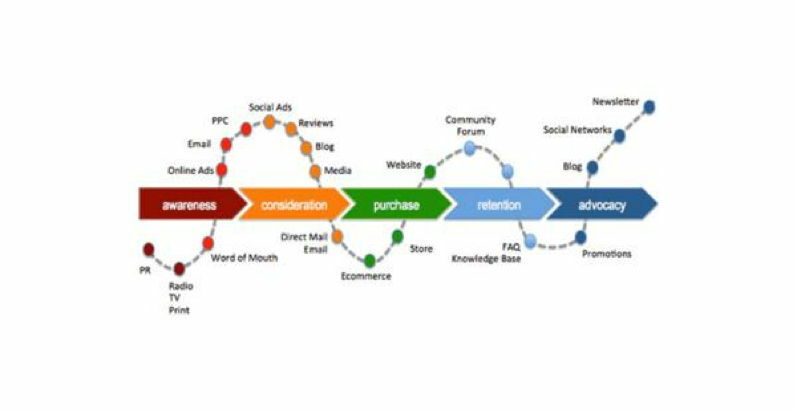 This process also allows you to customize your customer’s journey and put content in front of the segments that will likely respond based on their past behaviour. Content auditing and scoring require a lot of work upfront. It can be challenging to stay on top of this practice. However, it is necessary to truly understand the impact your content is having on your target audience. As you move through this process and make it a routine part of your content marketing strategy, you will sharpen your approach and be able to promote the right content to the right audience. If you don’t know where to begin, there are a variety of website content quality checker tools out there that can help get you started. Again, this approach is detailed, but it can put you in the best position to produce high-quality content that converts. Michael Bibla is the Content Strategist at Atomic Reach, a content intelligence platform used by marketers to generate more leads from their text-based content. He’s on a mission to empower marketers with actionable data so they can make more informed decisions about their content strategy.